There are several finds of metal buttons from the 14th century, but no surviving garment with metal buttons, from this period. At least none that I know of. 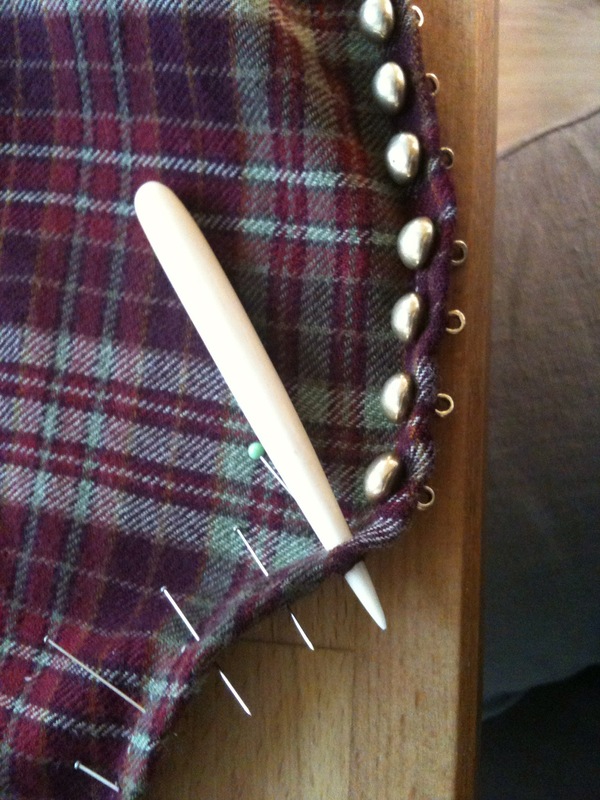 I have often considered the best way to sew these buttons on to a garment. They have really long ”necks”. Why? Are they sewn directly onto the fabric edge, or are they attached the way people put metal buttons on folk costumes in the 19th century? Besides, the 19th century is way too late a period to look at when making 14th century outfits. Anyway, I did the same thing on my buttoned dress as was done on the 16th/17th century coat. The thread/ leather strap is sewn onto the fabric to prevent the buttons from ”falling out” of their holes. 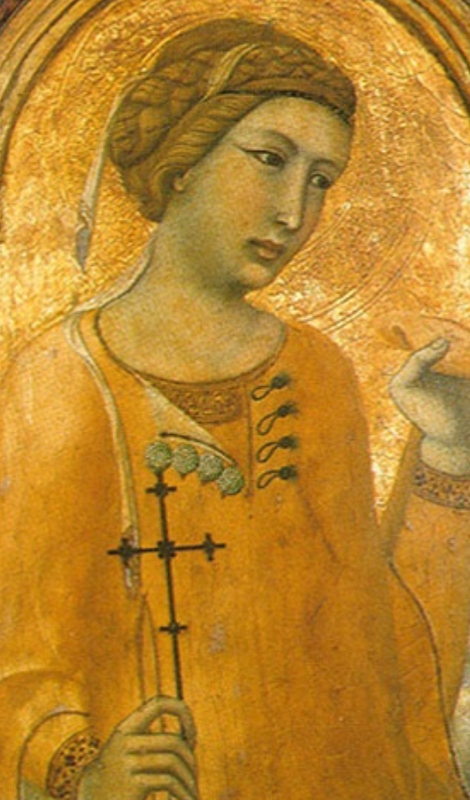 About a year ago, I stumbled upon this picture of St. Margaret by Pietro Lorenzetti (1306-1348). She is probably from Italy. Today, the painting can be found at Musée de Tesse, Le Mans, France. Look at her metal buttons. 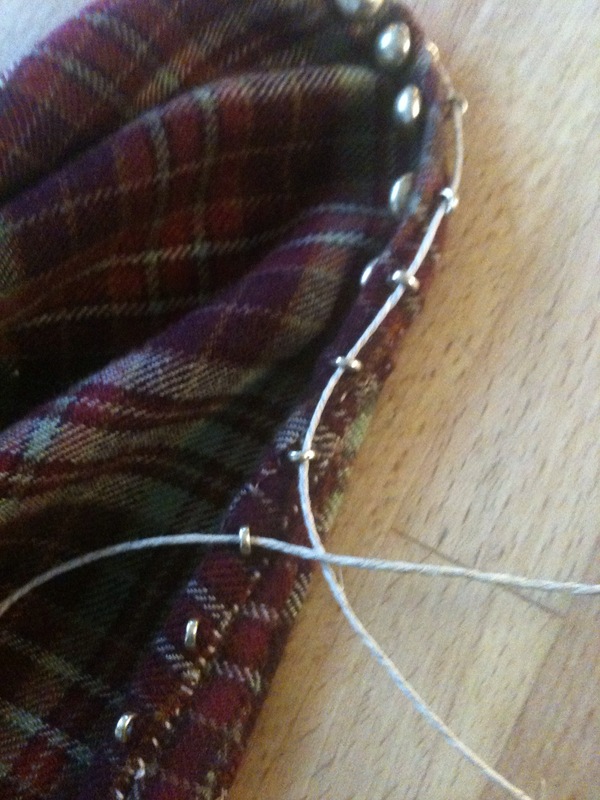 The inside shows the method for fastening the buttons. To me, it surely looks like they were attached the same way. I think the reason metal buttons have such long necks, is that they must be long enough to pull though the fabric. A shorter neck would be preferrable on buttons placed right on the edge, the way you would place fabric buttons. 25 januari, 2015 i Crafting, Research, Textiles, Written by Maria. ← Do you do living history? The leather strap is sewn on to the fabric between evry button, with many stitches. So it can only rip a stitch at the time. And the stitches are on the inside so they are not really exposed to something and won’t get stucked in anything. The strap is sewn in between the loops. So that means that it won’t just fall out and loose all the buttons. The shanks are, in many original buttons, long. But we also have finds of buttons with shorter shanks. I think there are buttons with shorter shanks that was sewn on the edge. Man behöver väl extra överlapp för att göra på det här sättet? Hur får man till det snyggt i ärmar tror du? Det behövs inte. De ligger kant i kant. The primary reason why this was done–so I’ve been told–was so that people could own one set of expensive buttons, but wear them on multiple outfits. If it was true that people were switching their buttons from one outfit to another every few days, then it doesn’t make sense for them to sew the lacing down. However, if they used a lucet or fingerloop braid for the lacing, the likelihood that it would break would be very, very small. I’m curious about that yellow bit of trim you have at the top of your dress in one of the pictures. What is that? It looks like something I’ve done with a couple of my dresses, where I braid a bit of heavy thread and then sew it onto the edge. I do it primarily to hide where my lining wants to stick out and show, but it’s also intended to fake the tablet-woven edges that they did on some of the wool garments. I’ve never seen anyone else put tiny trim like that on their dress, so I was curious if yours is tablet-woven or a braid or something else entirely? The changing buttons I’ve heard too and I think it makes sense. The yellow is a silk tablet woven edge. The worsted wool was so thin so it didn’t get me a proper neckline when it was sliding. My husband sewed the dress for me and he was the weaver too. But the buttons and the buttonholes he left for me. This is very good nteresting! I had not seen this method of buttons at such an early time period. 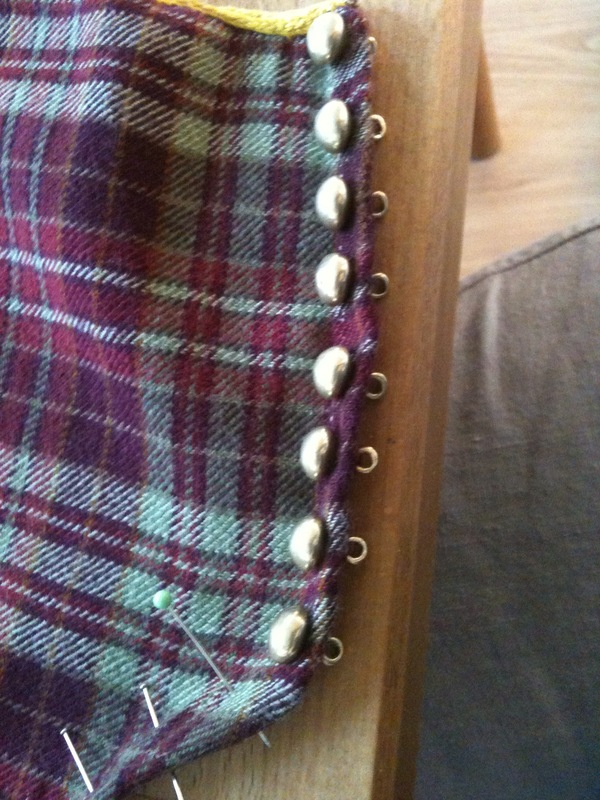 It’s also interesting to note the loops not buttonholes. Is this because it’s a neck fastening and not a whole front of a garment? Do you mean the loops or the string?